Getting into shape when you’re in your twenties, when you’re care free and don’t have to worry so much about what you eat is a breeze compared to when you’re getting older, have 30+ years worth of injuries, pains and muscular imbalances alongside the stressors and strains of running a multi national business which includes lots of travel, affects the number of times per week you can go the gym and often dictates the very food that’s available for you to eat. 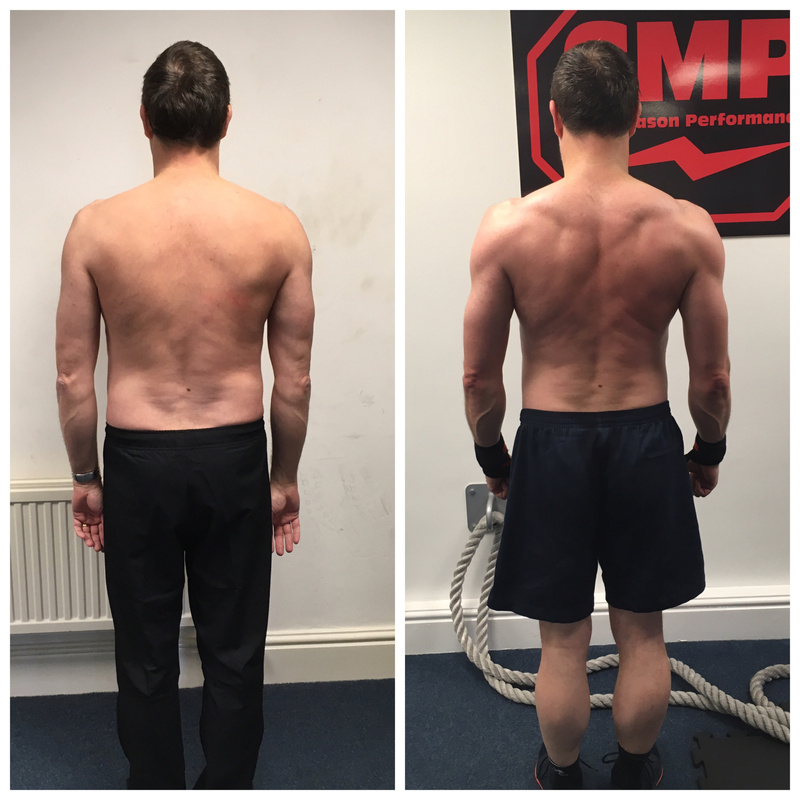 Which is why, as you’d expect, CMP client Andy is pretty amazed at what he has achieved through our body transformation program. 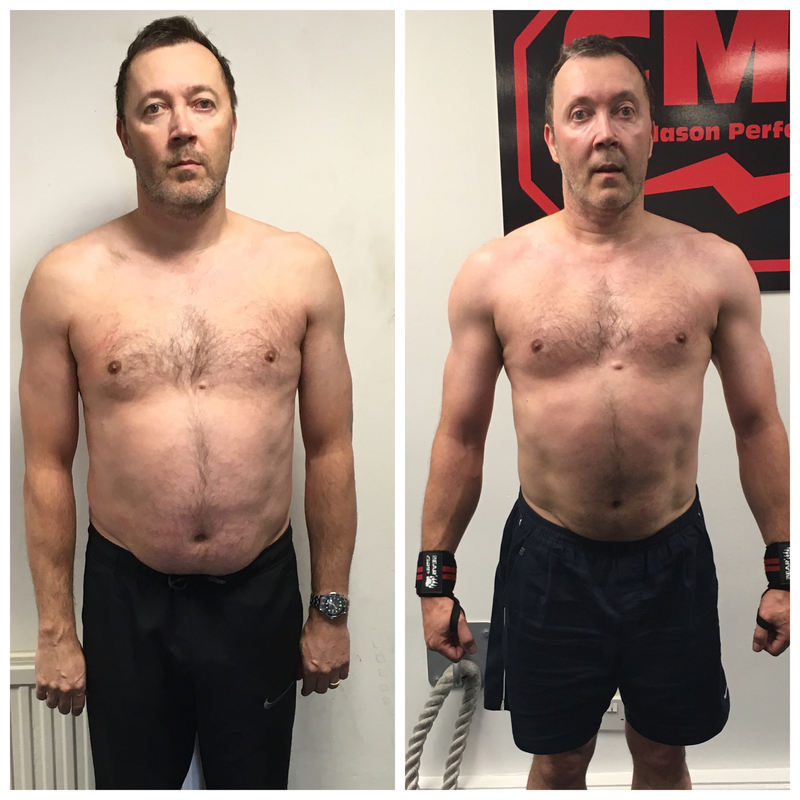 Great improvements in 12 weeks Andy, How are you feeling? Overall I feel a lot stronger in my body and mind. My body shape is changing for the better. You had many injuries before starting the program which made certain exercises and ways of training problematic, can you tell me a bit more about those injuries and how the affected you? In 1982 I had a motorbike accident; I broke my leg in 3 places including my arm. I was also left with multiple problems in my back, which has made anything i’ve ever tried problematic to say the least. My left leg was half the size of my right leg because of the level of muscle wastage that occurred from my accident and remained this way until i joined CMP and started the program. I needed to find someone who would be able to work with me and still help me lose weight and tone up. After 35 years of neglect CMP is not only improving my posture and strengthening areas weakened by the accident. So your results must have surprised you even more then considering? Yes; my overall change in posture, waist-line, body strength and shape are far more than I expected. I often refer to myself as a challenge because my issues made it difficult for me to exercise pain free when i started but now that i am stronger, i am in less pain and feel myself improving. Like many business owners, time is limited. Did you think you would achieve these results training only 3x per week? No not on your life! CMP have taught me that you only get one body, you need to look after it with the appropriate exercise and diet. Before i was just eating on the go and grabbing food where i could, now i am thinking more about what i eat and how much i eat of it. From this i can now see how the foods that i eat impact how i feel in and out of the gym. What other improvements have you experienced? What surprised me the most is that whilst I haven’t lost any scale weight, my body shape and body fat improved. I now fit back into clothes that i haven’t been able wear for a long time. What would you say to others thinking about joining our program? What’s been the biggest thing that you’ve learnt from your 12 week transformation? Exercise is not enough on its own; you need a good diet, commitment and an excellent trainer who knows what he’s doing! Apply here if you want to work with us 1-2-1 in our private transformation gym in Sheffield. What would it mean to you if you achieved these goals and improved your health, fitness, appearance? I'm not, i'd rather stay the same. I want serious head turning RESULTS.